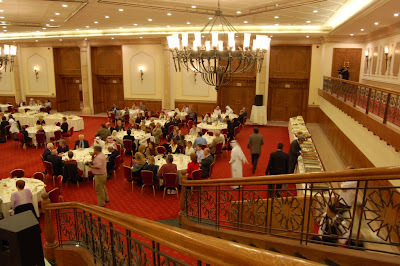 After our long day trip to Shaybah we then went out for the Farewell Dinner. This was not the end of our trip, but more like the end of the reunion activities for the most part. 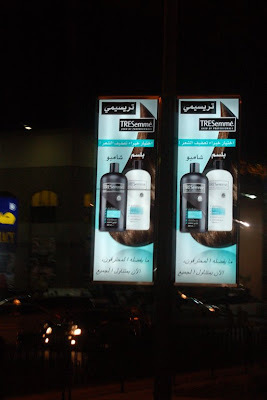 as well as banners on all the streetlight posts advertising TRESemme shampoo. The kind that I happen to be using at the moment! And this wasn't just in Khobar, but also in Hofuf where we had been on the day we saw the camels. The dinner was put on by 10 businessmen who wanted the publicity. Their names were at the entrance to the hall where the dinner was held. The place was called SEEF and it's not like anything we have here. Imagine the reception portion of a hotel. 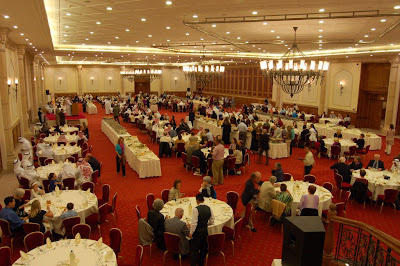 Large open ballrooms with high ceilinged lobbies in between them. That was the whole building. We went into one large ballroom for the reception portion of the evening. There were white couches around the walls and nothing in the center. The room was maybe half full and I would say most of the 500+ reunion attendees were there! Imagine the size of that room! There were waiters walking around with more dates and Arab coffee. I ate plenty of dates and sat on one of the couches with our friend Molly just people watching. It was quite interesting for sure and I was too tired to do anything else! Finally after we'd been there over an hour we were motioned to dinner. Across the lobby... into a room at least twice as large as the one we'd just been in! I'm not sure these pictures really even do it justice. Beyond the stage, which you see just beyond the long white table and along the left wall is another half of the room. Just like at the Welcome Dinner there were multiple food tables set up with at least 10 main dishes as well as salads and appetizers. 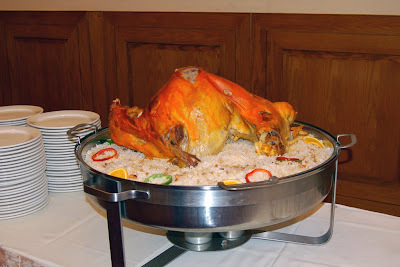 This is kabsa. It's a whole lamb. It's really really good! After eating way more than necessary (are you seeing a trend in their hospitality yet?) I found the fruit "mountain" and dessert table. 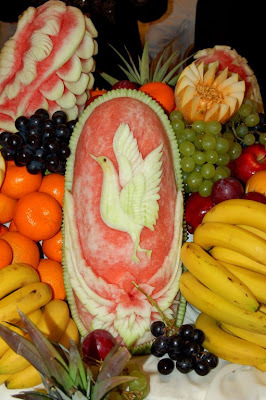 Seriously crazy works of art on the fruit! We finally made it home about 10:30 and just crashed. And in case you're wondering... yes, I gained about 5 pounds on this trip and Brian gained 12! 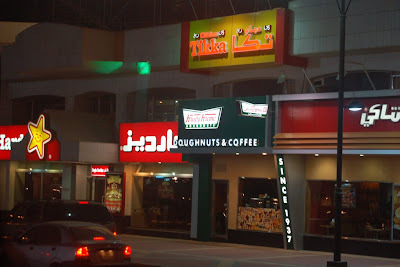 Okay, so they have a Krispy Kreme in Saudi Arabia, but none within a 50-mile radius here in Warrenton? How crazy is that!! 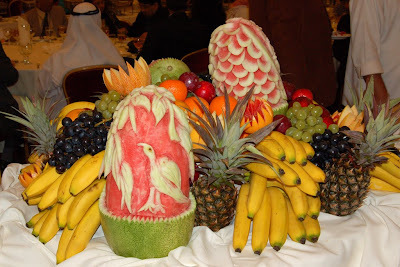 I love the fruit...I wouldn't want to eat it for fear of ruining it! I heart Krispy Kreme!! The pictures are lovely and I can only imagine that it does not even begin to describe what you saw (seems pics never do, do they?). 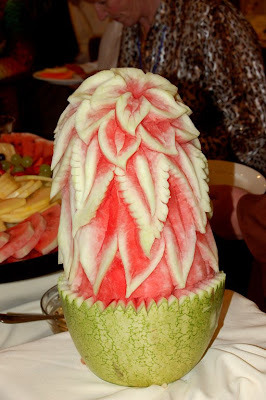 Those watermelons are amazing! Looks like you had a fabulous time. What an evening! !